Encolpius, a soldier of fortune, despiser of pedantry, lecherous and contrary, and the beautiful Giton, who lives off his charms, are invited to a gargantuan banquet hosted by the prodigal, pompous, newly rich Trimalchio. When the feast turns into a riot, the two, joined by the down-on-his-luck poet Eumolpus, leave town quickly to avoid trouble. So begins the Satyrica, a bizarre odyssey through the carnivalesque landscape of Nero's empire. 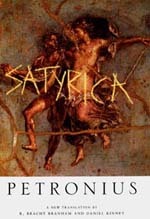 The author of the Satyrica, Petronius, had been Nero's intimate and advisor on all matters of artistic taste and elegance but a jealous rival turned Nero against him. No longer enduring "the suspense of fear or of hope," Petronius eluded his former patron by ending his own life. His novel has lived on, preserving for centuries tales of a time when virtue and vice, power and money, human comedy and human cruelty, mixed and melded unpredictably. The translation is accurate and contemporary. In addition, a chronology, introduction, and commentary offer the reader background on Petronius's social milieu and on the fascinating complexity of his seemingly low-brow novel's poetic structure. R. Bracht Branham is Associate Professor of Classics and Comparative Literature at Emory University. He is the author of Unruly Eloquence: Lucian and the Comedy of Traditions (1989), which won Harvard's Wilson Prize. Daniel Kinney is Associate Professor of English and Director of the Comparative Literature Program at the University of Virginia. He has written several studies of Medieval and Renaissance genres and is a prize-winning translator and editor.